Hunan has three famous hei cha, or black tea, which comes from the province. Perhaps the best known here in the west is fu zhuan cha or fu brick tea (Kor. bok jeun cha). This tea is a favorite and one drinks it heavily during the late summer and in times of seasonal change. This tea is a simple tea, not as flashy nor complex as other hei cha such as puerh, it has the distinctly subtle effect of regulating, harmonizing, centering, and grounding and strongly resonates with the Earth Element. No wonder this tea is loved by many monks in Korea. Fu brick tea is harvested during the hottest days of Summer, this makes it unique among other types of tea that are usually best harvested in Spring. The harvest time strongly influences the subtle and physical characteristics of fu zhuan cha. Biochemically, tea leaves that are picked in Summer have more fluorine, catechins, and are therefore more bitter and contain larger, dark green leaves. 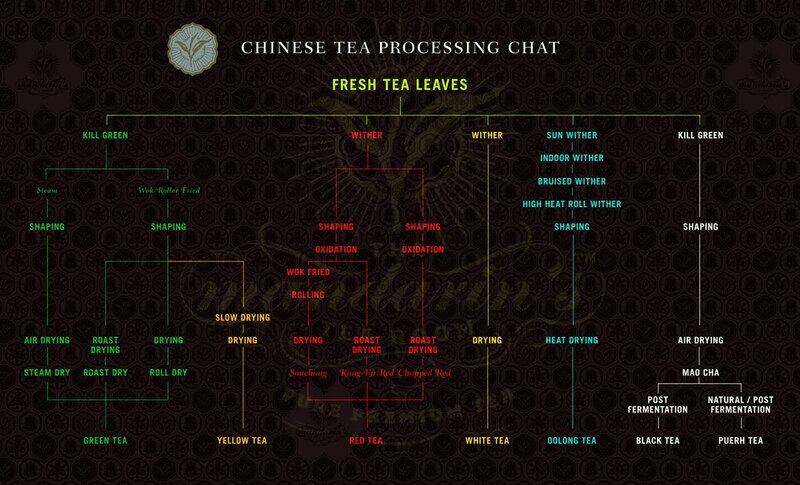 The bitter taste is surprisingly absent from all fu zhuang cha as it is eliminated through fermentation of the leaves. The high fluorine levels however can cause bone weakening especially later in life if this tea is consumed daily (see here and here). The Summer tea leaves used for fu zhuan cha also grow slower and have more of a warmer thermal nature, having absorbed the heat of the hot Summer sun. What gives fu zhuan cha its regulating, harmonizing, centering, and grounding properties is its special production method. Its production is rather complex and involve twelve steps which include: fresh picking of leaves, panning, pile fermentation, rolling, drying, softening with steam, piling, partitioning, pressing into bricks, fungal fermentation, drying, packing and storing. In the end there are many pro-bacterial flora that proliferate in the finished tea the most commonly recognized is the eurotium cristatum bacteria which produces fu zhuan's famous "golden flower" yellow mold. It is famous because it is most noticeable to the naked eye. However many other bacteria are found in fu brick tea, and not all brick tea contain golden flowers. Fu zhuan cha has a special affinity for the digestive center, the Earth Element. This is partly because of its slightly warming thermal nature which fortifies digestion in the body but mainly because of its bacterial content. According to the theory of the Five Elements, Yellow is the colour of the Earth Element and the Stomach and Spleen are the organs of the Earth Element. It is no wonder that the quality of a particular brick is often measured by the amount of "yellow flowers" contained in the brick. The Earth Element is also connected to the Late Summer season and the change of season at the equinoxes and solstices. Fu zhuan's strong centering qualities allow us to get through these periods of change with its stabilizing qualities. As a result it is the tea that best harmonizes us with this season. Its mild, unpretentious taste and smell neither impart too much yang not yin, helping to again stabilize us along the path of the middle way. Fu tea contains a mild sweet taste. The sweet taste is said to be the taste of the Earth Element further harmonizing it with these energies. Traditionally this tea has been used to aid in digestion by remote Tibetans and Mongolians. Recently it has been found that the bacterial cultures in fu zhuan cha increase protein and carbohydrate metabolism, while preventing the absorption of fat in the body. Years ago Japanese studies have shown fu tea to be the best tea for weight loss which is probably due to this newly discovered effect. The dry leaves are a multicoloured mix of medium young fuzzy leaves, mainly buds, which give off a savory-meaty odour with thin tobacco smoke, strong pungent deep forest odours and sweet light fruit smells under all of it. The first infusion pours a pure vibrant yellow. Sweet, cool, pungent tastes expands in the mouth there is a light, savory base that is barely noticed underneath it all. A long pungent pure tingling occurs on the tongue. Minutes later sweet, slightly creamy, root beer tastes pop up in the mouth. The second infusion presents with sweet, clear, pure initial tastes which numbs the mouth with a soft tingling mouthfeel before pungent-sweet notes bring on light candy-melon-fruit notes. The mouthfeel reaches the mid-throat and opens it with a soft-creamy-candy-sweet coolness. Saliva pools quietly in the throat. The third infusion has an initial taste that is pure, sweet, and stretches into a cool, sweet taste. The mouthfeel sticks to the teeth, saliva pools deep in the throat, and a strong vibrant banana-melon, sweet creamy-candy aftertaste is left lingering in the mouth. The fourth infusion sees a sweet, pure, initial taste that is smothered by a mouthfeel which coats the whole mouth and throat. After this sensation recedes, there are barely savory-pungent notes under more vibrant, distinct sweet creamy fruit notes which open into the throat. The qi is very relaxing and cooling to the extremities. In the core there is a slightly warming sensation. It feels very nice in the body. The fifth infusion is much the same with more distinct sweet candy-like fruits in the initial taste. A cool sweetness starts to gain momentum in the throat then slowly expands outward. There is a very light pungent taste caught in the mouthfeel which adds separation and depth from the dominating sweet high notes. This depth is clear in this fifth infusion. The sixth infusion has even more distinct fruits and sweet high note tastes up in the initial flavour. The thick mouthfeel overtakes these light flavours somewhat and leaves a long, fruity-sweet aftertaste behind. In the seventh and eighth infusions everything becomes slightly softer with the high notes still quite strong but more smooth, less distinctly vibrant here. There are noticeably tangy melon edges now. These high note tastes are most noticed along with distinct returning coolness in the aftertaste where they maintain there overly vibrant quality. The qi strongly brings up the mood, and intensely focuses the mind, and makes the hands and feet feel cool, almost tingling. In the ninth infusion crisp, sweet high notes begin to be muddled with forest notes in the initial taste. Tangy melon notes from the initial taste stretch into the aftertaste. The tenth infusion sees a slight, quick flash of savory and bland forest which turns sweet then is washed away with a mouthfeel which later brings sweet-creamy fruits on the breath. The mouthfeel continues in the deep-mid throat and mouth but is becoming slightly less dense now. In the eleventh and twelfth infusions sweet, but mild banana-like fruits are in the initial taste and distinctly span the profile of this infusion. The flavour has softened considerably now. The mouthfeel softens but continues its strong presence. There is a long-candy-like aftertaste left in the mouth. In the thirteenth infusion there is more wild foresty depth found but still may high notes to be enjoyed. This tea has stamina because in the fourteenth infusion is finally starts to loose lots of its flavour. There is still a faint spattering of previous flavours, the mouthfeel still full in the throat. Put to an overnight infusion these leaves give a pungent, cool, vibrant offering of fruity high notes. In a recent article in the journal, Transaction of the Royal Asiatic Society, Korea Branch, Volume 86, 2011, ISSN 1220-0009, by the foremost English authority on Korean tea, Brother Anthony of Taize, published a piece which challenges some older assumptions about the history of Korean tea. The paper is ground breaking as it slightly shifts the lens of which we can view Korean tea culture, in particular tea in the Late Joseon Dynasty (1392-1897). The article looks at the actual historical literature of this period, some of which has just been recently discovered. The following post looks at five previous assumptions about Korean tea that are challenged in this thought provoking article. Assumption #1: It was the suppression of all things Buddhist, including tea drinking, by the ruling Confucian Joseon Dynasty which contributed to the decline of tea culture in Korea. "When we turn to the history of Korean tea, the first difficulty we face is the lack of documents from the Goryeo period [918-1392]. It is usually assumed that tea-drinking, which had been introduced from China along with Buddhism in the earlier Silla period [57BC-935], continued to be widely practiced in the strongly Buddhist Goryeo period. Tea trees had been planted near temples in the southern areas early on. Yet from the early Joseon period, when records start to become more plentiful, there is no sign of tea being drunk as a sophisticated or civilized pursuit anywhere, in the court, by scholars or by monks. It might be that this decline had already begun under Goryeo." The first mention that tea was drank in such as way came, according to Brother Anthony, is from a poem by Jeom Pil Je, Kim Jong-jik (1431-1492) in 1481 where he suggests two important points. First, that tea production has declined, at least in his area of Hamyang. In the maps and detailed geological records from 1454-1530 called Sejong Shilrok Jiriji or The Cultural Geography in the Veritable Records of King Sejong Of the Joseon Period, show that there were over 30 areas of tea production in Southren South Korea, with Hamyang being one of them. Secondly, the Korean Kings demanded tribute tea from certain areas of Korea, and likely had some refined way of enjoying their tribute. This shows us that although there is a record that showed that tea grew abundantly in Korea, there is no record of a sophisticated tea culture and therefore no proof that it indeed existed in the Early Joseon Dynasty at all. Assumption #2: Yi Mok's (1471-1492) ChaBu (Rhapsody to Tea) is evidence of sophisticated tea culture in Korea and suggests the depth of Korean tea culture. "There is no indication as to when or why he [Yi Mok] composed the ChaBu (Rhapsody to Tea), which is unlike any other text devoted to the Way of Tea found in Korea or China, although the influence of the Classic of Tea and other Taoist Chinese tea texts is evident in it. The most striking absence is the total lack of any mention of tea being grown or drunk in Korea. The text is only about the Chinese Tradition." This suggests that Yi Mok's ChaBu was strongly based on Chinese tea culture and contains no evidence of tea culture in Korea. Assumption #3: Korean tea culture was kept alive throughout the Joseon Dynasty at Buddhist Temples. "Tea, we may say with some assurance, was only known in the Joseon dynasty when scholars and diplomats brought some back from China. There is no record indicating that anyone made and drank it for pleasure in Korea. The first extensive text about Korean tea making known from the Joseon Dynasty is Bupung Hyangcha Bo (Record of Native Tea Made At Buan c. 1756) by Pil Seon Yi Un-Hae [1710-?]." Pil Seon Yi Un-Hae, states in this record, "I heard that there was famous tea growing at Seonun-sa Temple in Bupung. Neither officials nor ordinary folk knew how to drink it, they treated the bushes as mere weeds and used them for kindling, so they were in a bad state." Yi Deok-ni's Record of Korean Tea states, "In our Eastern land (Korea) tea grows in various localities of Honam (the South-west) and Yeongnam (the South-East). The places listed in the (offical geographical texts) Dongguk yeoji seungnam and the Gosa chwalyo etc are only one tenth, one hundredth of the total. It is customary in our land to use what is known as "jakseol" in medicines but most people do not realize that "cha" and "jakseol" are the same thing. The reason is that for a long time now nobody has made "cha" (tea) or drunk tea. Supposing some dilletante buys tea at a market in China and brings it back, nobody knows how to appreciate it." It goes on to say, "Once tea reached Korea by ship in Gyeongjin year (1760), the whole country learned what tea looks like. It was drunk widely for the next ten years, and although stocks were exhausted a long time ago now, nobody knows how to pick and make more. Since tea is not so important for our countrymen, it is obvious that they are unconcerned wheather it exists here or not." Brother Anthony reiterates this message, "It is clear [by interpretation of Stanza 12 of DongChaSong] that he [Cho'Ui, the Saint of Korean tea (1786-1866),] felt the art of making good tea was barely known anywhere in Korea, even among monks." "There is an often repeated claim among Korean tea experts that it was Hyejang [a monk] who introduced Dasan [1762-1836] [a Confucian] to tea; recently, however, Professor Jeong Min of Hanyang University has argued convincingly that the opposite was the case. Certainly in the poem [of their first meeting] Dasan implies that he knows what to do with tea leaves once he has them, he does not ask Hyejang to give him already dried tea and indeed it is clear from later texts that Hyejang knew nothing about tea except for what he learned from Dasan." This suggests the opposite is actually true, where confucians likely knew more about tea durring the Joson Dynasty than the Buddhists. Their knowledge likely came through close trade ties to China. Assumption #4: Tea was drank in a loose leaf form durring the Joseon Dynasty because of the sophistication of the literi which preferred it this way over the more Buddhist cake style of drinking tea. Afterall, the use of loose leaf tea was described in the ChaSinJeon which Cho'Ui, the Saint of Korean tea, made a copy of it. In Bupung Hyangcha Bo (Record of Native Tea Made At Buan c. 1756) by Pil Seon Yi Un-Hae states that, "many buds are picked, pounded, formed into cakes and roasted." Brother Anthony states, "Rather strangely, the Ming style tea described in the Chinese text is leaf-tea, and the text was not revised to refer to the caked variety of tea that Cho-ui had learned from Dasan. It seems from various writings of Cho-ui that he only began to make tea around this time. The method he used was that which he must have learned from Dasan years before, that know as "caked tea"
In the Epilogue of the article Brother Anthony states, "Yi Han-yeong (1868-1956), who continued to make and sell caked tea in Gangjin during the Japanese occupation (1910-1945) in a manner he always claimed to have inherited from the practice of Dasan and his students. He called his tea Baekun-okpan-cha. He was the only person known to have been producing and selling a specifically Korean form of tea during the Japanese colonial period." This suggests that tea was consumed in Korea with very little sophistication, tea not as fine loose leaves but produced as medicine, likely in a form similar to ddok cha. Assumption #5: Korea developed and used its own tea implements for appreciating tea. In Yi Deok-ni's DongChaGi he states, "In the spring of Gyehae year (1743)... Our host had prepared places beneath the pines, close to a tea-brazier; brazier and utensils were all Chinese antiques and we each enjoyed a cup." This shows us that Korean tea implements were not used in the consumption and appreciation of fine tea, which was not local tea but that imported from China. Besides challenging these old beliefs about Korean tea, Brother Anthony's article gives those interested deep historical background to which we can understand the Korean classics in a more complete way. Highly recommended reading. Thought it would be interesting to prepare back to back notes on these two autumn Man Zhuan cakes (only later did one stumble on Hobbes post which also featured both these two cakes as well). Thanks to Hobbes for sending these guys last year in a big box of samples. The cakes are both available from Yunnan sourcing (see here and here). What makes them interesting is that they are from the same family farm. Found it interesting, but not too surprising, that they had such pronounced differences. Let's see what the two sessions have for us, the 2009 pictures are on the top and the 2010 pictures on the bottom both are above the relevant text. The dry leaves of the 2009 smell of gritty, foresty, light, barely menthol, pungent odours in medium chunky leaves. A faint malty plum is also found in there but is very very faint. The 2010 leaves have a sweet, light, fruity-floral smell over a sweet-tangy, wild forest smell. Already the differences are quite apparent. The 2009 first infusion yields very watery, bland, sweet notes with just the slightest edge of strawberry in the aftertaste. Mainly there is just watery empty tastes. The mouthfeel is also very light. The 2010 is watery, but with a creamy floral initial taste which fades into a faint spicy-plum over nice creamy notes. Minutes later a foresty taste is left in the mouth. The mouthfeel is chalky in the mouth. The second infusion the '09 starts off with an empty-watery, forest and buttery initial taste with only a slight sweet edge. A slight, cool edge makes a ghostly return to the mouth with slight, barely fruit odours coming later. The mouthfeel is light and pasty up front, sticky on the tongue and root. The '10 has a sour-dirty-pungent, forest initial taste that leaves a sweet-floral taste in the chalky mouthfeel. There is a dirty forest-tobacco like taste that comes up later. The third infusion is still the same initial taste for the '09 but the finish is now a forest, buttery, slightly cooling, barely fruit taste. The mouthfeel becomes quite expansive and opens the throat to an increasing returning coolness. The mouthfeel seems to bind the aftertaste into something substantial from a rather empty initial taste. The '10 presents a sour-floral, dirty-forest, initial taste with the creamy floral taste stuggling under the gritty base. The mouthfeel is a slightly coarse-chalky type with the top throat begining to open a bit. Minutes later a cooling, dirty, slightly tobacco taste comes up and fine floral taste is in the breath. The fourth infusion of the 2009 starts an empty, watery, creamy initial taste with a very soft barely forest, buttery sweet, faint floral finish that feels like a cloud on the mouth. Its creamy sweetness seems fused with the sticky mouthfeel now coating the mouth and upper throat. Minutes later a soft spicy note mixes with the sweet buttery creamy. The qi si mild and lightens the chest when breathing. The substantial mouthfeel holds flavours in the mouth for a long time. The fourth infusion for the 2010 was less revealing. I delivers sour, dirty-tobacco like initial taste which turns into heavy, malty, sweet florals. The florals slowly lighten into a more creamy sweet base. There is a cool sensation in the top throat. The qi causes one to breathe deeper and lighter as it disperses mainly in the chest. The 09 fifth infusion offers up a very soft, sweet, malty initial taste which transfers to a creamy, sweet, fluffy aftertaste which lingers in the mouth. Overall very similar to the fourth. The 10 looses some of the harsher sour edges in the fifth infusion. It presents with malty, slight forest initial taste which contains a sweet, malty, floral-cloudy, creamy buttery finish which is left on the tongue. A slight apple taste is had on the breathe now. The 09s sixth and seventh offer a watery, empty, even bland initial taste with thick, buttery, malty, bland-sweet aftertaste. The aftertaste has subtle creamy floral dimension that also stays on the breath. The sticky mouthfeel continues to hold. The 10s sixth and seventh offer a lighter, malty, slight forest initial taste. The finish becomes a obvious malty, sweet, creamy, long cloudy floral finish. The mouthfeel is a touch dry and lightly chalky. The qi is mainly felt in the chest and warms the head. In the eighth the 2009 cake presents a bland, malty-pear initial taste which now has a spicy-malty edge over a predominately sour-bland base taste. The creamy tastes have now subsided and is just lingering in the background. The ninth infusion sees the bitter profile dominating the initial taste then slowly fading barely revealing any creamy sweetness. The tenth infusion sees a watery, barely sweet apple inital taste with barely creamy aftertaste. The eleventh is much the same with very faint spiciness in the aftertaste. In the eighth, ninth, and tenth infusions of the 2010 cake, the initial tastes become more empty and watery with a sour-bitter edge now becoming dominant. The aftertaste slowly looses its long high note, creamy sweet floral finish after each infusion. The qi is starting to beat up the stomach a bit here and the mouthfeel becomes grainier with the chalkiness dropping off completely. The dry mix of many white hairy leaves emit strong sour notes with deep pungent forest and light fruitiness. The first infusion delivers a drity, gritty, bland-forest tastes. There is a noticeable coolness in the throat along with a sour aftertaste and a faint sweetness that fades away quickly. The mouthfeel is quite full especially noticed on the roof of the mouth. The chaqi is apparent from the first cup with its strongish nature. The second infusion presents a dirty, gritty, bland forest inital taste. Now it has hints of simple florals pinned undernieth as well as sweet, long complicated fruits. The fruity and sour notes last longest on the breathe. The distinctly cool-sour aftertaste develops a certain smoothness. The mouthfeel reaches the mid-throat opening it but is also felt on the roof of the mouth and in the teeth. Qi is strong as ones mind kicks up into a keen alertness. The third infusion offers a thinner, sour-citrus-gritty-forest taste now. It develops into a bland-floral citrus sweetness. The sour taste lingers in the mouth with slight mellow edges minutes later. With all that is going on, there is a bland note that prevents anything from being too vibrant and muddles it into the interesting profile. A result common in autumn puerhs. The mouthfeel remains full. The fourth and fifth infusions offer a sour, meaty, forest initial taste with a slight citrus-sour-floral finish. Now it has lost some of its exotic, wild-foresty taste. The sixth infusion offers a short lived foresty-soft-meaty-bland taste that turns into a distinct citrus-grapefruit finish with flowery edges. In the breath minutes later are bread-like starchy tastes. The qi is quite alerting. The seventh infusion offers muddled, dry forest initial tastes with sour notes waiting undernieth. There are chalky-bitter grapefruit notes that finish the profile until minutes later reveal sweet citrus that lingers on the breath. The mouthfeel has become less in the throat and have developed a slight coarse edge that is felt even minutes later. This tea is quite interesting as there seems to be more flavour change with each infusion although not all are always as desirable. The eighth infusion gives us a creamy, sweet initial taste with a lingering bland forest which is pushed into the distance with a long citrus finish. The qi is still strong here but very relaxing on the mind. The ninth infusion is also much the same with a slight pungent quality mixed with the creamy-sweet initial taste and more pronounced sour taste that pairs with the citrus finish. A chalky mouthfeel develops in the mouth. The tenth and eleventh infusions are more sour-foresty initial taste with the lighter notes disappearing. The aftertaste has a bitter, slight grapefruit edge. The chalky mouthfeel continues. The twelfth infusion is bitter, sour melon notes in a bland-forest aftertaste. Pictured above is traditional coin shaped ddok cha from different producers in different years. From left to right and top to bottom: 2002 Teamaster Mrs. Beak, 2007 Teamaster Mrs. Jung, 2008 Joytea, 2012 Bohyang. You can see from the photo the change in colour as the coins age from a dark green colour of the 2012 coins to dark slight reddish tinged brown of the 2002 coin. The odour of the dry coins also change considerably from vibrant, sour, slightly pungent, floral notes in the fresh coin to more rich, deeper, fruity, slightly medicinal, odour after five years, to a more grainy, deeper, fermented smelling 10 year coin. Please stay tuned to future posts where we will explore the changes in taste, smell, mouthfeel, and qi as we steep up some of these old rare ddok cha coins.